This workshop celebrates Irish history as expressed through the voices of songs the Sean Nos way. Workshop attendees will begin the journey of the Irish experience from the old world to the new by learning in a classroom setting, a traditional Irish song, in Irish. From the wild mountains to the soggy turf, we’ll travel an Irish road, add in some history and lore, and then open the floor up for round-robin sharing. Come to listen and share your musical stories. This is a mostly an a cappella singing workshop, open to beginners, but also, if you have something more complicated you’d like to bring, feel free to share and ask questions. 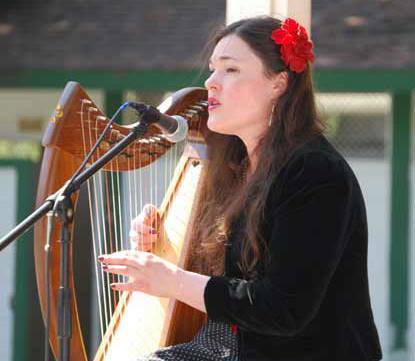 Amelia Hogan sings traditional Irish, Scottish, British American, and contemporary folk music with lilting graces and a subtle power. You’ll be transported into another time and place where the bansidhe cries and lovers embrace. Haunting melodies, stirring passion, and evocative storytelling is what you’ll find. Slàinte!